Underwater radiated noise (URN) has been a concern for naval vessels and specialized quiet vessels for many decades. SSPA has been involved in numerous acoustic-related projects for continually developing various predictive tools, making them available to assist customers in solving problems related to URN. Today, we can see a growing interest in URN from merchant ships as well and we recognize that underwater acoustics is coming out of the military closet. In 2008, the International Maritime Organization (IMO) added “Noise from commercial shipping and its adverse impact on marine life” as a high priority item to the work of its Marine Environment Protection Committee (MEPC). In 2010, EU Marine Strategy Framework Directive (MSFD) defined indicators where two of them mainly corresponded to shipping noise. In 2010, the classification society DNV released a new Silent Vessel Notation Class. Four of these classes are aimed at improving performance of special purpose vessels while the Environmental class is more geared towards giving merchant vessel owners a way of proving to the public and industry that they are trying to improve the green credentials of their vessels. Thus, there is a growing need to predict radiated noise from ships and propellers especially for propellers with cavitation. Naval vessels and research vessels are designed for high cavitation inception speed and low non-cavitating noise; hence, they typically have a large blade area, unloaded blade tips, a high blade number and highly skewed blade design. These measures come at the expense of reduced efficiency. A merchant ship propeller is optimized for fuel efficiency, which is further stressed by the IMO Energy Efficiency Design Index (EEDI). For merchant ships this means lower blade area and higher tip loading. Thus, the optimum propeller design will have some amount of cavitation. However, excessive cavitation can cause erosion, high pressure-pulses and thrust reduction. The project consortium consisted of 14 partners from universities, consultancy companies, model basins, research centers and classification societies. The state-ofthe-art techniques used for noise prediction and noise abatement were investigated. Within the work package “Modelling”, a benchmark study was carried out for a LNG ship by CETENA and SSPA and the results were compared with the sea trial data. CETENA applied a chain of boundary element methods to predict the tonal noise, whereas SSPA compared three computational tools described below. Benchmarking of tools at a far field location H2. URN is expressed as sound pressure level (SPL) at 1m distance from the noise centre (propeller). The vertical lines in the background are multiples of blade passing frequency. The data is relative to reference values for confidential reasons. PROCAL is the abbreviation for CETENA’s methods. 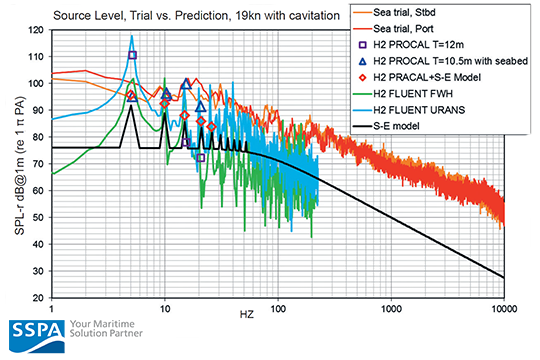 PROCAL with seabed reflection effect agrees very well with the sea trial data for the first three harmonics. “PRACAL+ S-E Model” was obtained by adding the cavitation contribution estimated by S-E Model to the PRACAL results for the non-cavitating noise. Noise signals appear in two different forms: broadband and tonal noise. The noise sources are inherently embedded in the near field flow around the ship’s hull and propeller. For instance, the turbulent boundary layer and the wake of the hull and propeller blades contain largely fluctuating shear stresses and vortices, contributing to broadband noise. The inhomogeneity of ship wake results in a periodically varying loading on propeller blades. These periodic loadings cause radiation of tonal noise at blade passing frequencies (BPF). Therefore a physically correct resolution of these features is essential for a reliable prediction of radiated noise in the far field. Cavitation on a propeller contributes to an added level of noise over a wide frequency spectrum. Cavitation noise occurs when the cavity volume changes (e.g. the growth and collapse of cavitation). Collapsing cavities cause broadband noise in a frequency range up to 100 kHz. In addition, sheet cavitation produces tonal noise at harmonics of BPF, due to the fact that cavity volume changes with pressure variations when the propeller blade passes through the wake field. The radiated noise is influenced by many factors, e.g. the hull form, ship speed and propeller particulars. The resulting noise signature is often a consequence of re-modulation of multiple noise sources and noise does not radiate symmetrically in all directions. Field measurements of URN are very much affected by the sea environment. In shallow waters the propagation of low frequency signals are prevented. This effect is clearly present in the sea trial data used here. CETENA’s study demonstrates how the first harmonics of tonal noise are modified by the boundary reflection effect due to the existence of a shallow water seabed near the ship. 1. Model-scale testing: Predicting full-scale pressure fluctuations traditionally relies on model-scale testing. 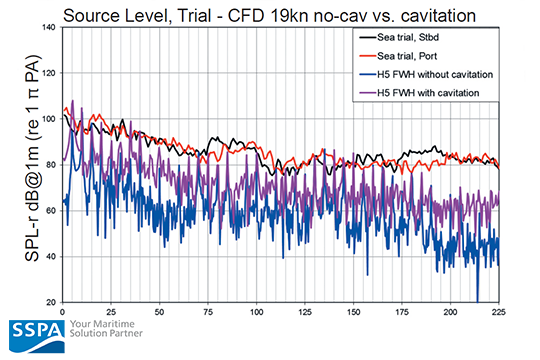 Noise signals are measured in SSPA’s large cavitation tunnel for a fully appended ship model and the results are scaled up to full scale. 2. Potential flow (PRACAL): A Lifting Surface program performs analysis of propeller performance in an inhomogeneous wake first. NOISEGEN is then used to calculate the noise at blade frequency and its harmonics due to blade loading and thickness. The method is a finite-difference approach using two forms of solution to Ffowcs Williams-Hawkings (FWH) wave equation. 3. Semi-empirical modelling (S-E): Semi-empirical models were developed at SSPA mainly for naval ships and underwater vehicles at early project stage. An S-E model does not require detailed geometry information of hull and propeller. It can be used to estimate both the tonal and broadband noise for propellers with and without cavitation. 4. ANSYS FLUENT: ANSYS FLUENT offers a hybrid approach with three flow solvers of increasing resolution capabilities: an Unsteady Reynolds-Averaged Navier-Stokes (URANS) method, a Detached Eddy Simulation (DES) and a Large Eddy Simulation (LES). The idea behind the hybrid method is to solve the near field flow with a flow solver while the far field noise is computed by integrating FWH wave equation. Predicting vortex cavitation requires better resolution of turbulent structures and flow unsteadiness, which may require an LES or DES solver rather than URANS. The advantage of these methods is that the noise due to the scattering effect of the hull and the broadband noise in the boundary layer can also be predicted. Selection of tool depends on factors like the aim of investigation, the type of ship and propulsor, propulsor with or without cavitation, eventual constraint on delivery time etc. Semi-empirical modelling and potential flow calculations are the fastest tools for producing results quickly while CFD calculations (FLUENT) take significantly longer. The time for model testing lies in between the two methods mentioned above, yet it needs some additional time for model manufacturing and set-up of the test. Difference in URN level between the non-cavitating and cavitating propeller. The FLUENT prediction shows that a narrow sheet cavitation on blades increases broadband noise by 15~20dB and tonal noise by 5~10dB compared with the non-cavitating case, agreeing well with the sea trial observation where an increase of 20dB broadband noise was attributed to the developed cavitation on blades. The tools in the benchmark study are able to predict tonal noise up to the first four blade harmonics to an acceptable level except the semi-empirical model. The hybrid method FLUENT captures more harmonics and wider broadband spectrum. Although potential flow methods are not able to predict broadband noise, they offer very effective alternatives for estimating tonal noise. More results are described in the paper by Hallander et al. “Predicting underwater radiated noise due to a cavitating propeller in a ship wake”, presented at the 8th International Symposium on Cavitation, 2012. It is important to consider and identify the problem related to noise at early design stage, thus avoiding the risk of re-design. It is usually at this stage that the cost-effective and technically beneficial solutions can be achieved. The total axial wake in front of the propeller at full scale. Instantaneous pressure field behind the propeller and hull. The predicted cavity pattern on the full scale propeller. A recent article in the magazine Marine Propulsion & Auxiliary Machinery highlights the growing concern about environmental impact of ship noise emissions. SSPA is an example of companies that offer services to help maximise both energy and environmental efficiency.